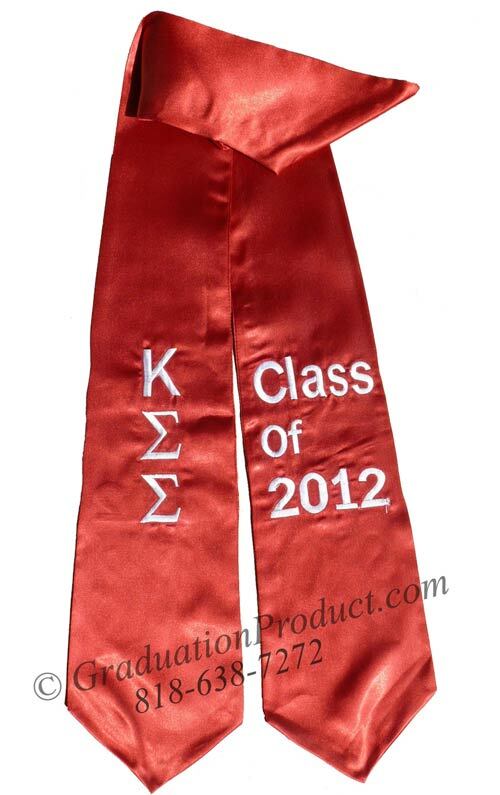 The Kappa Sigma Sigma Greek vertical graduation stole features customizable sewn-on letters placed vertically on the right side of the graduation sash. Customize this stole by choosing your stole color, letters, and letter color. This one-of-a-kind graduation stole is a keepsake that you'll cherish forever. Graduation stole is 62" long and made from bridal satin. Ordering Process: Select Stole color from Drop down box and Enter thread color of lettering and personalization text or Greek letters. You can also email us your design later with your order number at sales@graduationproduct.com. No Setup Charge. Start customizing your graduation stole. Pick your color of stole from drop down box, and then write down embroidery color what you want embroidered (such as "Class of 2015" and your Organization`s name in special instruction box. You can also Email us images and other details. The amazing low price high school Red Two Side Embroidered graduation honor stoles are stylishly made from light bridal satin and shaped to fit all body types. Fully lined throughout the high school royal graduation stole measures 30" long each side and 5.25" wide and has neat arrow pointed edges. Graduation Product is happy to offer the amazing discount high school graduation honor stoles to celebrate your graduates achievements. Check out the huge savings when ordering in bulk. Write you own review on "Kappa Sigma Sigma Greek Graduation Stole"